Why is Amuka the best place to find a shidduch? …Asher Kid’shanu b’mitzvosav v’tzivanu lehisateif ba’tzitzis! …She’hechiyanu ve’kiyemanu ve’higianu lazman hazeh! Older bachelors yearn for the day they will be zocheh to recite these brachos with emotion once they are married, on their very own brand new tallis. Read on to discover all the details regarding the Talis Hayeshuos – a unique segulah that has brought miracles and wonders, and brings a ray of hope even to those who have despaired of ever getting married! For many generations an accepted segulah for finding a shidduch has been to go out and buy a tallis with the intention of using it once married, from the day of the chuppah and onward. Tallis Hayeshuos is a special segulah that provides a ray of hope to despairing singles. The rabbonim of Yeshuos in Amuka do everything they can to end the solitude of those who have not yet found their zivvug. 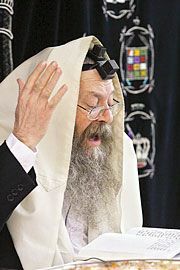 They consulted with mekubalim and Torah scholars – and that is how the Talis HaYeshuos was born: It starts with a fine, well-made mehudar woolen talis. It continues with special tikkun performed with the tallis at the kever of Rabbi Yonason ben Uziel! In this way, two big segulos are combined: the segulah of the talis, and the segulah of the tefilla at the kever of the saintly tanna, the gateway for the tefillos of those who have not yet found their shidduch. The tikkun that is performed with the talis is no simple matter. It is based on hirhurei kodesh – the special kavanos of the tikkun of the Ben Ish Chai, ztvk”l. The tikkun is performed by circling the gravesite seven times together with the talis, followed by special supplications and songs, with the tefillah that the owner of the talis will merit to use it soon under the chuppah. The power of this tikkun and it’s being performed at the kever of Rabbi Yonason ben Uziel can shine forth like a light in the darkness and unlock the gates of mazal! Can this segulah be used for women as well? Does it really work? What should I do with the talis once I have it?